DP World Yarimca is one of the largest container terminals of İzmit Gulf and Turkey with a capacity of 1.3 million TEU. * All of the investment was made with DP World equity capital. As a global brand, DP World operates 78 marine and inland terminals,including DP World Yarımca, in 40 countries and 45.000 employes. 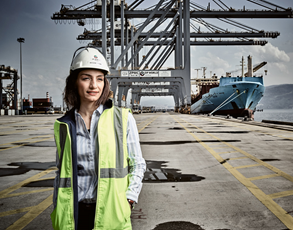 DP World Yarimca, the state-of-the-art terminal is equipped with super-post panamax quay cranes. Electrified Rubber Tyred Gantry Cranes (e-RTG) are being used for yard handling. We are implementing the very latest technology in terminal operations with gate automation and asset management systems being used for centralised activity planning and equipment control. The state-of-the-art terminal is focused to enhance the economy in the region and in Turkey through the supply chain efficiencies that it will create.